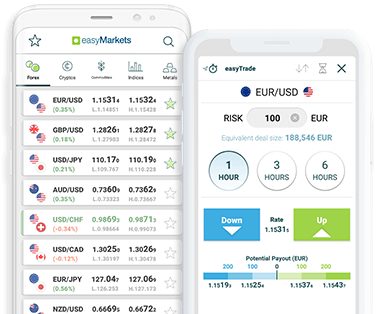 Fixed spreads starting from 1 pip, negative balance protection, undo losing trades within an hour for a small fee with dealCancellation* and around the clock trading support by phone or live chat. easyMarkets is a well-established company founded in 2001. Since our founding we have been on a mission to offer the best possible trading experience to our clients with our tools, service and offers. When it was established in 2001 easyMarkets was one of the first brokers to offer online trading and credit card funding. We continue to innovate, offering customers optimal trading conditions. Spreads are fixed on the easyMarkets MT4 and platform meaning your trades have greater price transparency. No matter the market conditions, your bottom line won’t change. With easyMarkets platform and trading app you can stay on markets around the clock. Use tools like dealCancellation, Freeze Rate, Inside Viewer and monitor your trades anywhere**. Risk management is the key part of achieving your investment goals – manage your risk/reward ratio with 100% guaranteed Stop Loss and Take Profit. Use MT4’s robust features to customize your trading experience. Use EAs and indicators to optimize your trading strategy. We cover your deposit and withdrawal fees, so that the amount you deposit or withdraw is the amount you receive. Our Negative Balance Protection means your account will never go below zero. Clients funds are kept in segregated accounts for further protection. easyMarkets™ is a registered trademark. Copyright © 2001 - 2019. All rights reserved.